This week we’ve been hit with an onslaught of bad news. Thousands of immigrant children are still detained and separated from their families, and the Supreme Court has validated Trump’s Muslim ban and attacks on unions and workers. But news and history aren’t just things that happens to us: they are things that we can shape and create. People’s movements are as important now as ever. All over the country and around the world, people are taking collective action to challenge injustices, proclaim our values, grow democratic institutions, and shift power from self-serving corporations and individuals to everyday people. 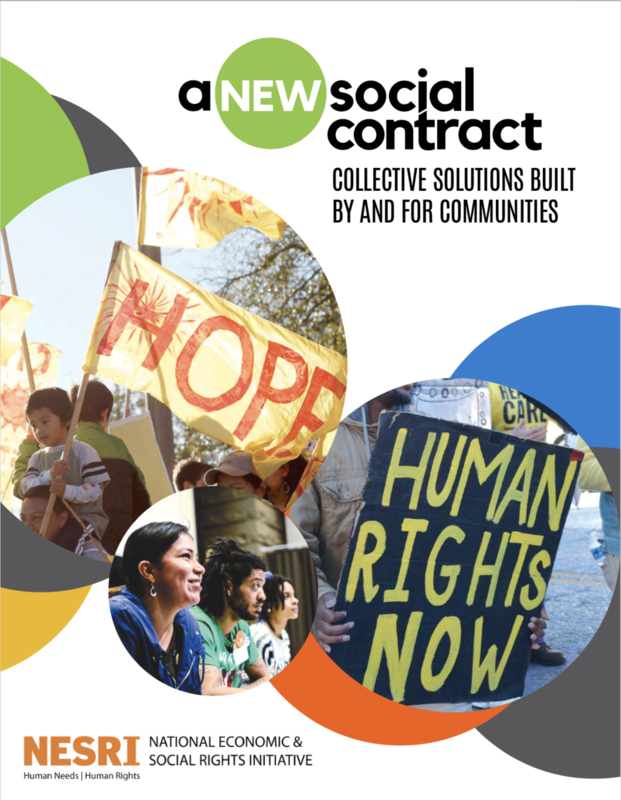 Here’s the latest news and history we’re creating in our Healthcare Is a Human Right campaigns for universal, publicly financed healthcare and an economy and society that put people ahead of profits. 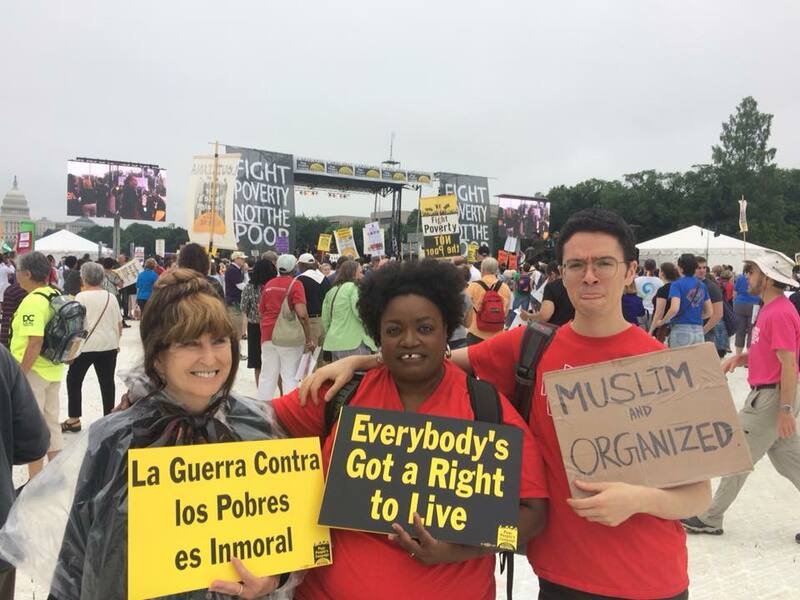 Fifty years after the original Poor People’s Campaign, we have joined with allies to launch a new Poor People’s Campaign: A National Call for Moral Revival (PPC). In 1968, Dr. Martin Luther King, Jr., and other Civil Rights leaders led the Poor People’s Campaign to demand a real war on poverty, full employment, guaranteed wages, and affordable housing. Today poverty, joblessness, the shortage of affordable housing, and the denial of healthcare are as urgent as ever. Put People First! 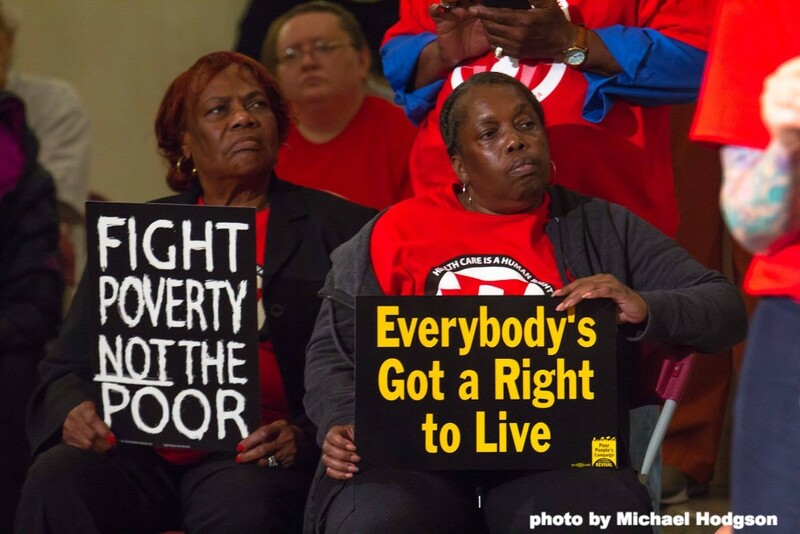 Pennsylvania (PPF-PA) has taken a leading role in Pennsylvania’s Poor People’s Campaign, turning out members to all six days of action at the State House during the PPC’s 40 days of action in May and June, and culminating in a march on Washington on Saturday, June 23. 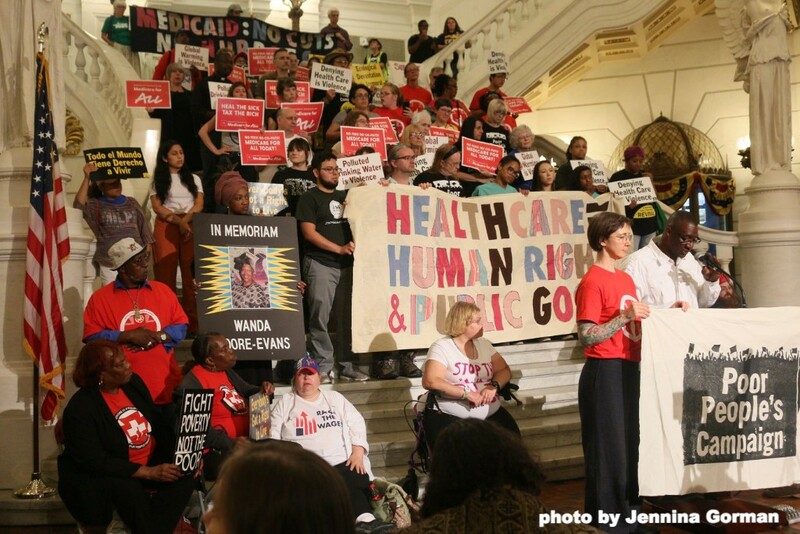 At a June 4 rally in Harrisburg, PPF-PA member Tammy Rojas spoke about her inability to afford dental care—and her consequent development of advanced periodontal disease—because access to dental care is not always covered through Medicaid or private insurance. 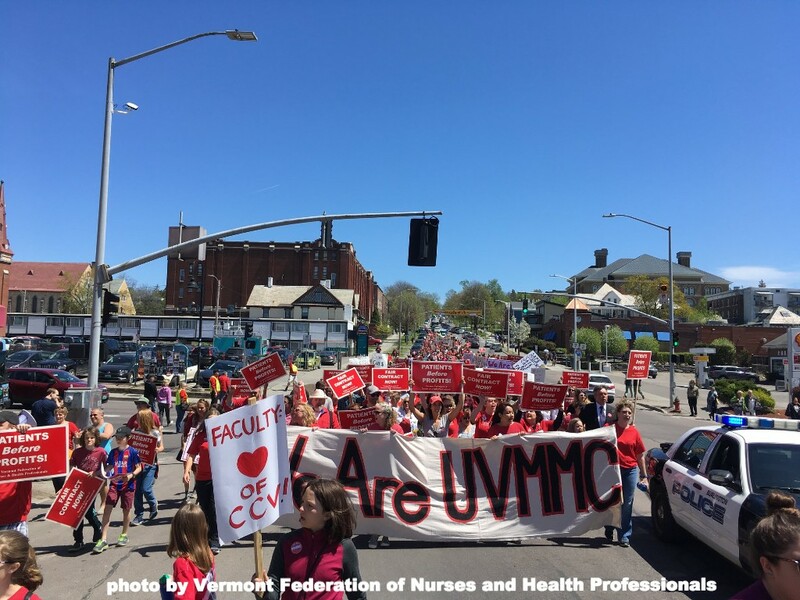 In Vermont, the Vermont Workers’ Center led a 200-person Medicaid March in St. Johnsbury in Vermont’s rural Northeast Kingdom region. The march is part of the Workers’ Center’s growing presence in the Northeast Kingdom and its statewide push to protect and expand Medicaid. 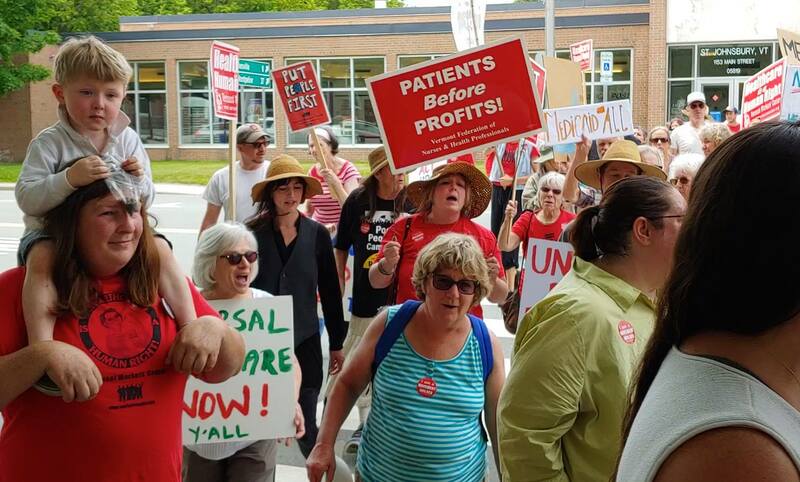 Read more: For more photos, videos, and on-the-ground the reports from Harrisburg, St. Johnsbury, and Washington, check out Put People First! PA’s and the Vermont Workers’ Center’s Facebook pages. In Maine, though voters voted 2-to-1 in November to expand Medicaid, Governor Paul LePage is refusing to implement the expansion and is simultaneously seeking federal permission to impose work requirements, asset disqualifications, premiums, co-pays, lockout periods, and burdensome paperwork requirements in order to push people off of Medicaid and make it difficult for new people to enroll. The Southern Maine Workers’ Center is fighting back. As Maine Equal Justice Partners prepares a lawsuit to challenge the validity of LePage’s proposal in court, the Workers’ Center will be organizing Medicaid enrollees, their families, and allies to resist the attacks and build power to win an expanded, more robust Medicaid program for poor and working people in Maine. While many of our members marched on Washington with the Poor People’s Campaign on June 23, Tammy Rojas and Laile Wilson from PPF-PA and Ben Palmquist from NESRI traveled to Minneapolis for the Single Payer Strategy Conference, where they joined allies from Healthcare NOW!, the Labor Campaign for Single Payer, National Nurses United, and many other organizations. 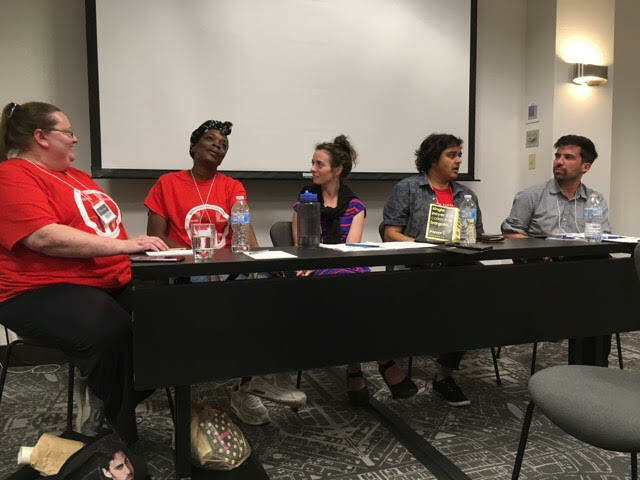 Tammy, Laile, and Ben teamed up with PNHP New York Metro, the Campaign for New York Health, and Democratic Socialists of America to present two workshops on strategies for building a multiracial, feminist, pro-immigrant, pro-poor movement for universal healthcare. Ben also facilitated a panel on building deep, strategic partnerships between labor and community organizations. He was joined by speakers from PNHP New York Metro, the California Nurses Association, Health Care for All Oregon, UE, and the Workers’ Education Society. 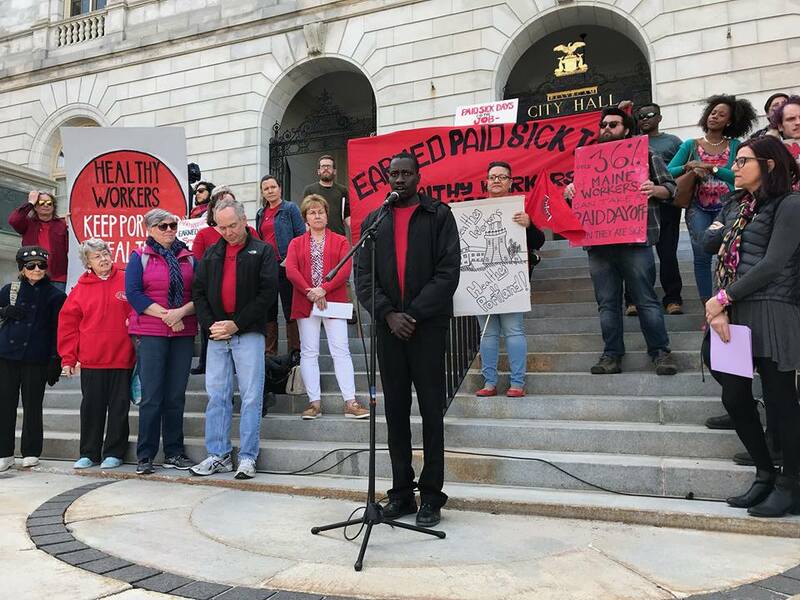 In Portland, Maine, the Southern Maine Workers’ Center is helping lead a campaign to push the city to require employers to provide paid sick days to Portland workers. The effort bridges the Workers’ Center’s Healthcare Is a Human Right and Work with Dignity campaigns, and is bringing the Workers’ Center into coalition with Equality Maine, Maine State Nurses Association, MaineTransNet, Maine Women’s Lobby, Portland Outright, Southern Maine Democratic Socialists of America, and the South Sudanese Community Association of Maine. Read more: Notes from the Single Payer Strategy Conference are available on the conference’s wiki site.